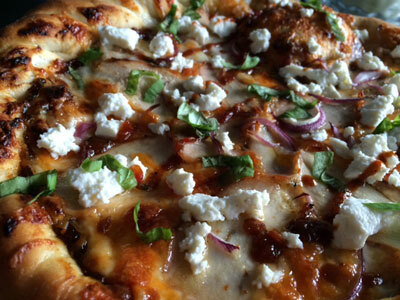 Starting on Friday, it’s everyone’s favourite week – YYC Pizza Week! What better way to support Meals on Wheels than by stuffing your face with delicious pie at participating restaurants. With so many options to choose from, you could technically have pizza for every meal – all for a good cause, of course. I was happy to participate once again in the Food Blogger Pizza Challenge. We were supposed to pick two out of the four ingredients from The Italian Store to come up with our creation. 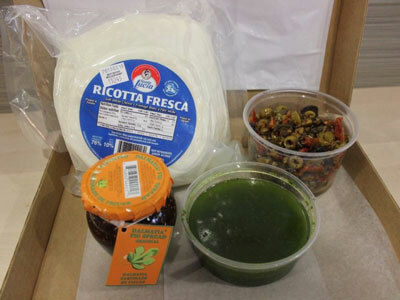 The four ingredients were: fig spread, homemade pesto, ricotta, pitted assorted olives. 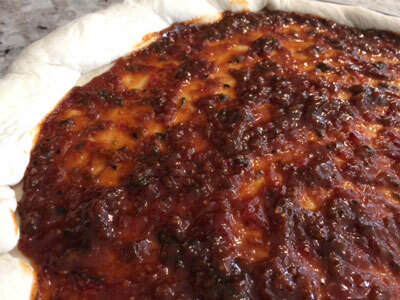 I chose to use fig spread and ricotta and Hubby helped in creating the Fiery Fig BBQ Chicken Pizza. The fig spread was used in creating the fiery bbq sauce. Made with the spread, poblano peppers, ketchup, balsamic and spices, the sauce was tangy and sweet and oh so good. We literally licked the pot clean. 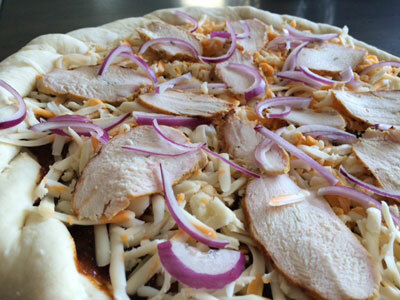 I topped the pizza with cheese, bbq’d chicken and red onions. Once out of the oven, I topped the pie with ricotta fresca, which added a creamy, cool component to the pizza. The pizzas from all the challengers will be posted on Friday where you’ll have a chance to vote. Be sure to visit a participating restaurant next week and support Meals on Wheels! Heat some oil in a pan and add the onions and garlic. Add the ketchup, vinegar, fig spread and spices and cook for a few minutes. Add the mixture to a blender along with the pepper and sriracha. Blend until smooth. Enough for one pizza.